The College Relations Director is responsible for assisting and promoting student chapter activities within the State. Serve as a liaison between student chapters and the State Council. Promote and assist with the formation of new student chapters by identifying potential sites and working with local professional chapters to develop these student chapters. Serve as a communications link between student chapters and National SHRM in disseminating information relative to student activities and programs, utilizing SHRM resources where available. Coordinate a state student conference, HR Games, and other activities, encouraging professional SHRM members’ participation and support of such events and supporting the host chapter as needed. Attend and assist with North Central Regional Student Conference. Work with both faculty advisors and local chapter presidents to encourage student participation in local professional chapter meetings and professional conferences. ; providing financial assistance when funds are available. Provide guidance to educational institutions as it relates to SHRM activities and the promotion of student involvement in SHRM. Promote the development and provision of scholarships for college students pursuing degrees with a Human Resources emphasis. Promote Human Resources as a professional field of pursuit within educational institutions and provide assistance, such as donating HR-related educational materials as applicable. Encourage Council members to participate in or view volunteer leader college relations webcasts. Provide financial support to student chapters as budgeted by the Council. Participate in Core Leadership Area (CLA) events, such as the SHRM National Leadership Conference, to obtain and share news and ideas. Attend student chapter meetings as necessary. Make regular updates to the College Relations section of the WISHRM website. Ability to visit student chapters throughout the state and attend state conferences required. Serve a one-year term beginning with the first day of January ending the last day of December. May be reappointed for two additional terms for a total service of three years. Terleen Cheslock is the Organizational & Staff Development Manager at Fox Valley Technical College. She is an experienced staff development manager with a demonstrated history of working in higher education. Skilled in compensation, corporate communications, labor relations, interviewing, and organizational development. 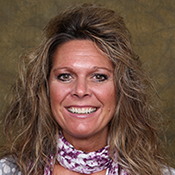 Terleen has her Masters of Science Degree focused in Organizational Development & Behavior from Silver Lake College. She has spent over 20 years in the human resources industry. Terleen also adjunct instructs in the HR program at the college.